Hours: Open year-round, sunrise to sunset. 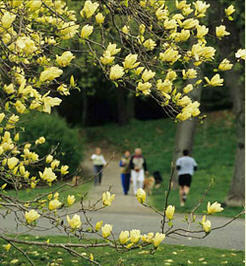 The Arnold Arboretum is one of the area's truly great places to get away during the spring, summer and fall. The two-mile-long main trail is paved and allows for leisurely stroller walks. Plant, flower and woodland life is labeled according to species. Another popular trail is the Rhododendron Path that features a log bridge and two small waterfalls. The Arnold Arboretum is America's oldest public arboretum displaying over 15,000 woody plants and offering educational programs for people of all ages. Seasons truly come alive in vibrant colors at the Arnold Arboretum. In the spring, the delicate perfume of lilac, mock orange, and viburnum float on soft breezes. By mid-summer, the Arnold Arboretum is ablaze with color and heavy with ripening nuts and fruit. In the fall, rich autumn colors catch the sunlight. Even winter is beautiful in the arboretum. The trees and shrubs stand in stark contrast to gray skies and snow-covered slopes. Find lots more ideas on fun things to do with the family in Boston. Picnicking is not permitted at the Arnold Arboretum. beautiful place, no cars, wide paths for bikes and strollers. very little trash, lots of separate mini environments, shade when it's really hot, and a creek to throw pebbles in, so many different types of plants and flowers, T accessible, BIG!